A lot of clubs and lounges in Seminyak built with elegant interiors designs to lavish outdoor landscape, adorned with beachfront lawns or pools with daybeds facing the ocean. Seminyak’s famous Ku De Ta might be the best example for this category, with its main restaurant area, bar, and a huge lawn bordering the beachfront that lay right at the backyard of the restaurant, where night parties and all special events take place. The Double-Six rooftop, a signature to the same-name Double-six beach region, is famous for attracting the upmarket crowd to its rooftop lounge facing right to the surf. In the heart of Petingenget, the Mirror Lounge and Club stands proud as an exemplary bars which take its interior design to the next level. The bar gives strong “Halloween at Hogwarts” vibe with its high-ceiling, Gothic cathedral structure with stained glass window and blazing laser lights. 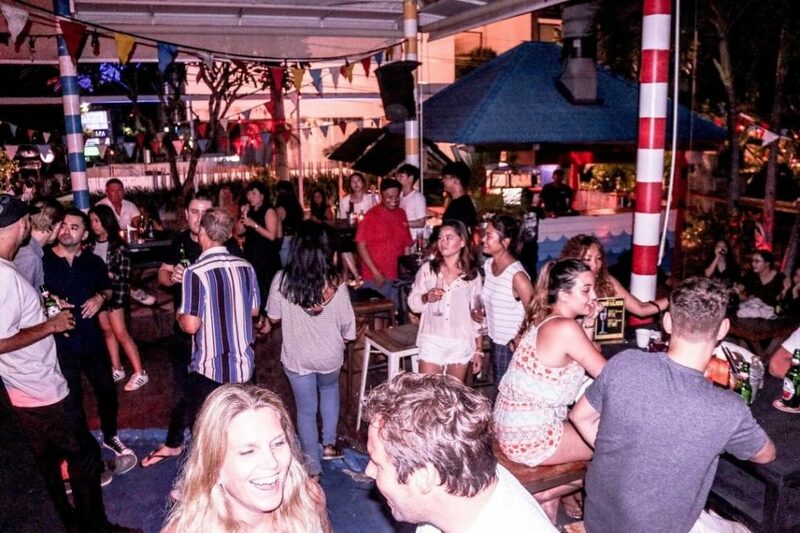 Here’s how you can really feel the difference of nightlife in Bali Seminyak differ from other regions on Bali. Seminyak is full of proud, exotic bars—owners who are willing to infuse their unique characters to their businesses. It’s the place where weird, thematic, and flashy bars glares its neon signs to the passing visitors. Yu might have heard of Motel Mexicola in Jalan Kayujati that made its name through its thick Miami slash Mexico vibes and brilliantly remixed old, nostalgic songs. Once the night darkens, Motel’s long restaurant tables and chairs in its mid-yard turned to be a shabby dance floor (yes, people actually dances ON the tables! ), before taken away by Motel’s personnels nearing the midnight. Only few miles away from Motel are the weird and wonderful Sea Vu Play, another remarkable nightlife Bali Seminyak venue that’s so popular among the globetrotters. It’s colorful nautical theme, complete with illuminated palm trees, is like a tropical oasis in the congested Petingenget. While the seafood restaurant offers chill and easy hideout during the daylight, the venue quickly turned into a lively party that goes wild and wilder down the night with queer performance. The chic, trendy, and weird Seminyak are definitely a crowd-pull for the youth. A lot of “grammable” places are the real lure to teenagers and twenty-something travelers. The next thing you know, Seminyak is filled with people on their age that are eager to try anything new, weird, pushing their borders, and would likely take the chance for a long-haul barhopping and taste a bit of everything nightlife Bali Seminyak could offer.